There is this constant dilemma of what dessert to make for an Indian meal. And while I fancy gulab jamun, kaju burfi or the ocassional jalebi, we can only manage a petite bite of this sugar-laden treat before being turned off completely. So the need for a miniscule amount to satisfy this once or twice in a year craving doesn't justify making them. Now what? 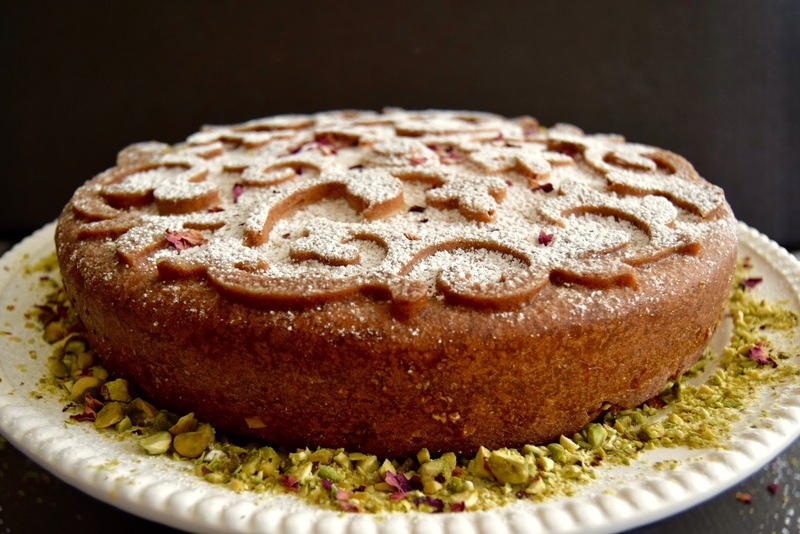 Enter Persian cuisine and its similar spices ... cardamom, coriander, cumin ... also... saffron, rose buds, pistachios. And this combination on a cake screams ... Pick me! Pick me! And so I did ... much to the delight of my family members and some friends I shared it with. This recipe is from WSJ where it was adapted from a recipe by Elizabeth Quijada from Abraço Espresso and Bakery in NYC. 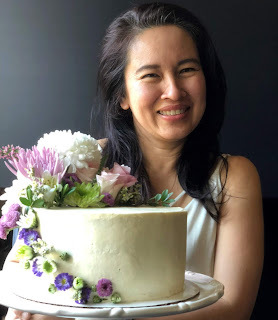 I adapted it again to make a tall-ish cake to fit my floral silicone cake mold and of course, decreased the sugar to allow for the syrup. 1. Make the syrup: In a small saucepan on low heat, stir all ingredients together until sugar dissolves. Set aside. 2. Place the warm milk and saffron threads in a glass measuring cup to bring out maximum aroma and flavour from the saffron. 3. Grease a 9 inch cake pan with butter or olive oil then line the bottom with parchment paper. 5. In a large bowl, whisk together flour, cornmeal, sugar, baking soda and baking powder and salt. 6. Make a well in the center, then add the eggs, milk and saffron, and olive oil. 7. With a sturdy whisk, mix the wet ingredients in the center together while slowly bringing in the dry ingredients into it, scraping down the sides of the bowl as needed. 8. 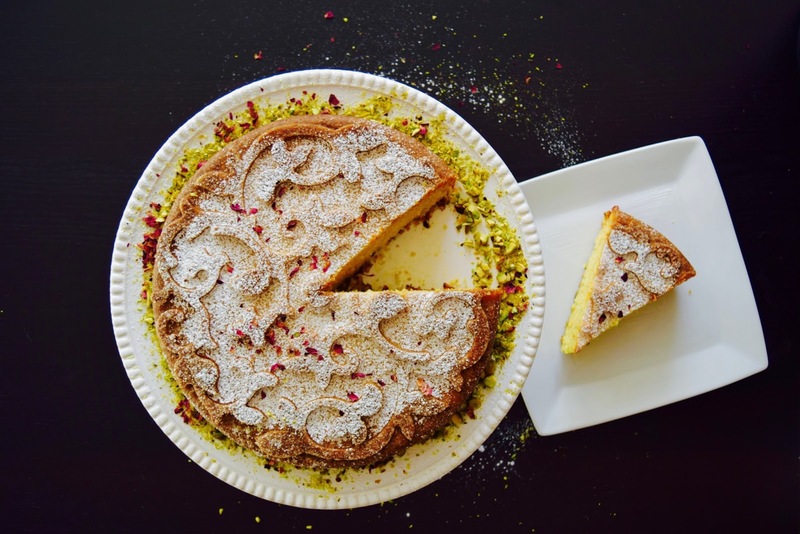 Pour batter into prepared cake pan and sprinkle the top with chopped pistachios. 9. Bake for 45-50 minutes until a skewer comes out clean. 10. Set on a cooling rack and let cool slightly before drenching it with that aromatic honey-saffron syrup. 11. Let it come to room temperature before inverting it into your cake platter. 12. Decorate with more chopped pistachios and maybe some dried rose buds.